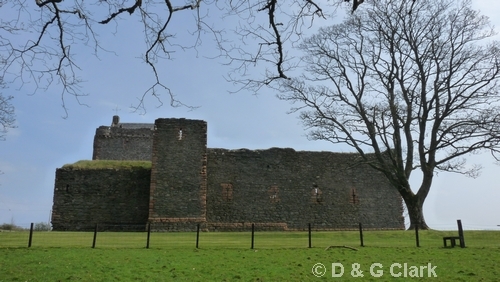 Kintyre forms the southern part of mainland Argyll and, at 68km long and 16km wide, it is the longest peninsula in Scotland. 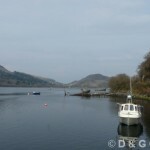 It is &lsquo;joined&rsquo; to the mainland at the isthmus of Tarbert and lies between the Firth of Clyde and the Atlantic. The long and varied coastline has numerous rocky shores and sandy beaches, including the Sound of Gigha which, outside the breeding season, hosts significant numbers of Great Northern Divers and Slavonian Grebes, good numbers of Eiders, Red-breasted Mergansers, Common Scoters, auks and smaller numbers of Black and Red-throated Divers, Long-tailed Ducks, Goldeneyes, and Velvet Scoters. Hills and moorland, which are now largely covered in commercial conifer forest, occupy the central spine haunted by Golden Eagles, Hen Harriers, Peregrines,&nbsp; Black Grouse and Ravens, with Short-eared Owl, Merlin and Red Grouse also present but less frequent. The conifers hold good populations of Crossbills, Sparrowhawks and Tawny Owls. The sheltered eastern side rises more steeply and has a diverse landscape of wooded glens (including remnants of ancient oak woods) and farmland with Great Spotted Woodpeckers, Tree Pipits, Common Redstarts, Blackcaps, Garden and Wood Warblers. 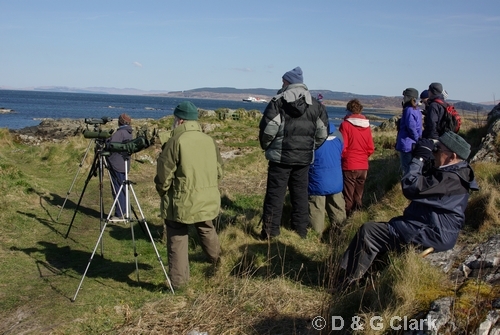 Kilbrannan Sound (between Kintyre and&nbsp; Arran) from Skipness to Claonaig is good for Black-throated and Great Northern Divers from autumn to spring. The windswept Atlantic seaboard has a more exposed grassland habitat and, along with the improved grazing at the Laggan, between Campbeltown and Machrihanish, holds large numbers of wintering geese, particularly Greenland White-fronted. To the south lie the dramatic cliffs, moorland and forest of the Mull of Kintyre with breeding Golden Eagles and Peregrines, with the lighthouse area attracting good numbers of migrant thrushes, Robins and warblers, and the chance of a rarity being seen. 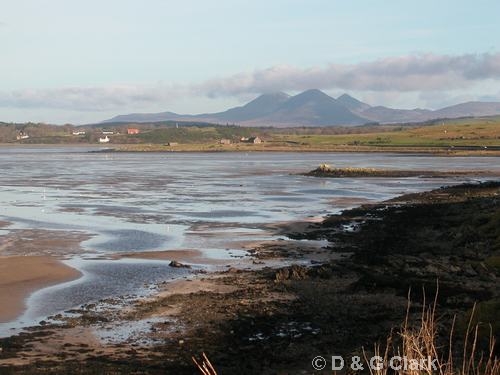 The mouth of Campbeltown Loch is attractive to many species of duck and wader in winter and even greater variety during migration with Black-tailed Godwit, Curlew Sandpiper, Little Stint and rarities being recorded. 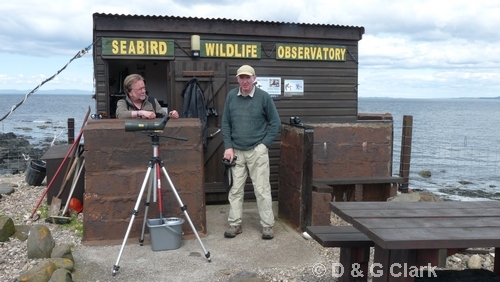 In the autumn, seabird passage at Machrihanish Seabird Observatory can be spectacular with large movements of Manx Shearwater, auks, Kittiwake and Gannet and regular sightings of Sooty Shearwater, Leach&rsquo;s Petrel, Sabine’s Gull and many more. King Eiders have been sighted along the western coast of Kintyre several times in recent years. The Sanda Islands lie off the south-east tip of Kintyre and hold good populations of seabirds including monitored breeding colonies of Common Guillemots, Razorbills, Puffins, Black Guillemots, Storm Petrels and Manx Shearwater. 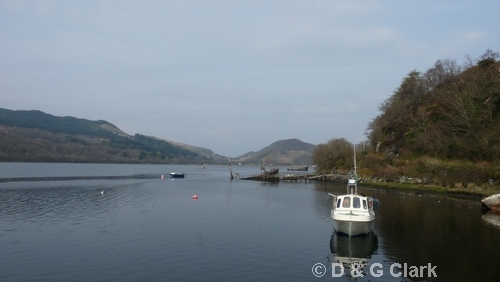 Habitat: Large enclosed sea loch and harbour. Birds of interest: Little Grebe, Common Eider, Common Goldeneye, Red-breasted Merganser, Peregrine Falcon, Oystercatcher, Ringed Plover, Eurasian Curlew, Common Redshank, Turnstone, Iceland Gull, Glaucous Gull, Common Tern, Black Guillemot. 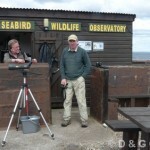 Habitat: Bird observatory on promontory just west of Machrihanish village. 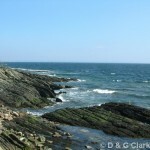 To the north, Machrihanish Bay is an extensive sandy beach backed by dune systems. Birds of interest: Whooper Swan, Greylag Goose, Brent Goose, Common Shelduck, Eurasian Wigeon, Eurasian Teal, Pintail, Greater Scaup, Common Eider, Common Scoter, Common Goldeneye, Red-throated Diver, Black-throated Diver, Great Northern Diver, Fulmar, Sooty Shearwater, Manx Shearwater, Balearic Shearwater, European Storm Petrel, Leach’s Storm-Petrel, Northern Gannet, Ringed Plover, European Golden Plover, Red Knot, Sanderling, Little Stint, Curlew Sandpiper, Dunlin, Ruff, Black-tailed Godwit, Whimbrel, Eurasian Curlew, Common Redshank, Greenshank, Common Sandpiper, Turnstone, Pomarine Skua, Arctic Skua, Great Skua, Sabine’s Gull, Glaucous Gull, Kittiwake, Sandwich Tern, Common Tern, Arctic Tern, Common Guillemot, Razorbill, Little Auk, White Wagtail, Common Raven, Linnet, Twite, Snow Bunting. Habitat: Coastal viewpoint overlooking the north end of the Sound of Gigha and the mouth of West Loch Tarbert. Birds of interest: Common Scoter, Velvet Scoter, Great Northern Diver, Slavonian Grebe, Shag. 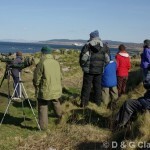 Habitat: Group of islands off the south coast of Kintyre with bird observatory and important sea-bird colonies. Birds of interest: Common Shelduck, Mallard, Common Eider, Red-breasted Merganser, Fulmar, Manx Shearwater, European Storm Petrel, Great Cormorant, Shag, Common Buzzard, Peregrine Falcon, Oystercatcher, Ringed Plover, Whimbrel, Eurasian Curlew, Common Redshank, Greenshank, Common Sandpiper, Common Guillemot, Razorbill, Black Guillemot, Puffin, Sky Lark, White Wagtail, Wren, Common Stonechat, Northern Wheatear, Sedge Warbler, Common Whitethroat, Willow Warbler, Common Raven, Linnet, Twite, Lesser Redpoll, Reed Bunting. Habitat: Sand and shingle bay looking across to Arran with woodland behind. Birds of interest: Common Eider, Red-breasted Merganser, Red-throated Diver, Black-throated Diver, Great Northern Diver, Northern Gannet, Common Buzzard, Eurasian Sparrowhawk, Oystercatcher, Ringed Plover, Dunlin, Purple Sandpiper, Common Sandpiper, Turnstone, Razorbill, Black Guillemot, Common Raven. 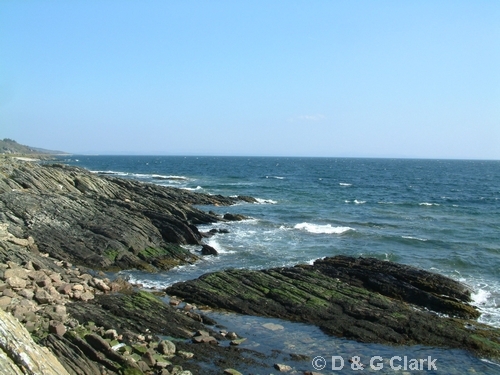 Habitat: Stretch of sea between Kintyre and Isle of Gigha including sandy headland at Rhunahaorine Point (NR6949). Birds of interest: Common Shelduck, Mallard, Common Eider, Long-tailed Duck, Common Scoter, Velvet Scoter, Common Goldeneye, Red-breasted Merganser, Fulmar, Red-throated Diver, Black-throated Diver, Great Northern Diver, Slavonian Grebe. 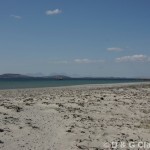 Habitat: Sandy south facing beach with views to Sanda Islands and Northern Ireland. Birds of interest: Good spot for early spring migrants. Common Eider, Fulmar, Northern Gannet, Shag, Hen Harrier, Common Buzzard, Common Kestrel, Peregrine Falcon, Sandwich Tern, Ringed Plover, Purple Sandpiper, Whimbrel, Common Redshank, Common Sandpiper, Turnstone, Sand Martin, Barn Swallow, House Martin, Pied Wagtail, White Wagtail, Dipper, Northern Wheatear, Common Stonechat, Fieldfare, Redwing, Linnet, Yellowhammer. 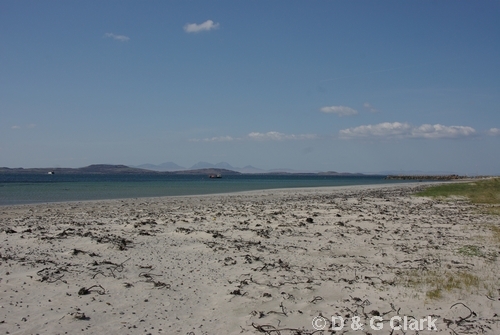 Habitat: Sandy beach with meadowland behind and ferry terminal for Gigha. Birds of interest: Mute Swan, Whooper Swan, Greenland White-fronted Goose, Greylag Goose, Barnacle Goose, Common Shelduck, Eurasian Wigeon, Eurasian Teal, Mallard, Common Eider, Long-tailed Duck, Common Scoter, Common Goldeneye, Red-breasted Merganser, Red-throated Diver, Great Northern Diver, Slavonian Grebe, Hen Harrier, Common Buzzard, Common Kestrel, Peregrine Falcon, Oystercatcher, Ringed Plover, European Golden Plover, Northern Lapwing, Red Knot, Dunlin, Common Snipe, Bar-tailed Godwit, Eurasian Curlew, Common Redshank, Turnstone, gulls, Sandwich Tern, Black Guillemot, Sky Lark, Rock Pipit, Common Stonechat, Northern Wheatear, Common Raven, Goldfinch, Twite, Reed Bunting, Snow Bunting. Habitat: Large sea loch with areas of tidal mud flats. Birds of interest: Mute Swan, Whooper Swan, Common Scoter, Common Goldeneye, Red-breasted Merganser, Red-throated Diver, Black-throated Diver, Great Northern Diver, Hen Harrier, Osprey, Dunlin, Eurasian Curlew, Common Redshank, Greenshank, Black-headed Gull, Common Tern, Black Guillemot.